Looking to start a business, but not sure how or where to start? 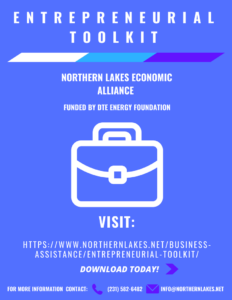 The Entrepreneurial Toolkit contains local resources on creating a business plan, financial planning, marketing your product or service and much more. Everything you need is right here! Download and print your Toolkit from any device. Starting a business in our NLEA three-county region? Download the Toolkit that applies to your area.